What: Haunted Halloween Costume Party and Fundraiser featuring a live musician, karaoke, prize raffles, costume contests and more. This event is for all ages. There will be candy throughout the house, and the neighborhood for trick or treating! There will also be food and drinks for snacking. Guests must pay at least a $10 donation to support The American Cancer Society-Relay For Life. Entry Donations for children are not mandatory, but encouraged. Additional donations qualify you for other contests and raffles!! When: October 31, 7pm – midnight. Bring your $1 bills for tickets!! Tickets are $2 each or 5 for $5! The more you purchase, the greater your odds! All supporting the American Cancer Society! What: Mile long walk, helps raise funds for Shelter House, Inc.
Additional notes: Shelter House is also partnering with Applebee’s – Falls Church. When guests present the Applebee’s Flyer on November 1st, twenty percent of their food and non-alcoholic beverage sales will be contributed to Shelter House. Dining flyers and the walker registration form are attached to provide additional information. Shelter House is a non-profit organization dedicated to breaking the cycle of homelessness here in Fairfax County by providing families with crisis intervention, temporary housing, training, counseling, and programs to promote self-sufficiency. One of the programs operated by Shelter House is the Patrick Henry Family Shelter in Falls Church. This facility is designated as Fairfax County’s shelter for large families of five or more members. With seven apartments, the Patrick Henry Family Shelter serves about forty residents everyday – nearly two-thirds of whom are children. In addition to the Patrick Henry Family Shelter, Shelter House also operates the Katherine K. Hanley Family Shelter in Fairfax, three transitional housing programs, an After Hours Homeless Family Crisis Center, and Shelter House was recently awarded the contract to operate Artemis House, Fairfax County’s domestic violence shelter. If you plan to attend the Shelter House Mini-Walk or should you have any questions, please contact Kristen Lenz via email or at 703-536-5383. Whether by yourself or with your family, come enjoy a fun day, a lovely walk and that incredible feeling when you’ve done something for a good reason — come out to the Katherine K. Hanley Family Shelter Mini-Walk Open House Saturday, September 12. The walk is truly mini — approximately 1.4 miles of stroller- and wheelchair-friendly terrain. But the registration fees go to Shelter House, the organization that runs the Katherine Hanley Family Shelter (KHFS) and your presence helps count towards the tally for the Fannie Mae Walk to End Homelessness — Shelter House will receive a donation from Fannie Mae based on the number of walkers they get from the combined tally of walkers at each of their mini-walks. So you help twice just by registering. In addition to the walk, the shelter will open its doors so you can view Fairfax County’s newest shelter, and the first homeless shelter in the country to win a Green Globes rating for its sound energy and environmental design practices. This shelter looks nothing like how most people imagine shelters — nestled in a residential neighborhood, most people driving on Lee Highway aren’t even aware of its presence. The Open House gives members of the community a chance to come learn more about the shelter via a scavenger hunt through the shelter, as well as just hanging out for some old-fashioned fun with a moon bounce, a magician, and more! 9:30 – 12:00 – Open House! Register by Thursday, September 3rd to receive your Help-the-Homeless Walkathon t-shirt! Registration is $15 for youth (25 and under) and $25 for adults! All of registration fee goes to Shelter House and is tax-deductible. Registration form is available at the Shelter House web site. More will be posted on the Shelter House web site as dates are finalized. Note, I am affiliated with the Katherine K. Hanley Family Shelter as I am on their Community Advisory Board. Your thermometer may be reading in the 80s and 90s but Fall will soon be upon us and you’ll be slipping on a nice, cozy, sweater. Wouldn’t it be great to get a warm, fuzzy feeling on the inside as well? The kind of feeling that comes from knowing you did something really terrific? Lands’ End is launching the FeelGood campaign in September — for every FeelGood sweater purchased, they will donate signature FeelGood yarn to One Heart Foundation’s Warming Families nationwide knitting charity. These volunteers will knit hats for homeless people across the country — Lands’ End is projecting donating thousands of pounds of yarn with volunteers making possibly 25,000 hats between September 1 and December. You can learn more about the campaign at www.landsend.com/feelgood. Want to help knit? Be sure to visit the Warming Families site. Disclosure: I received, as did other attendees, a FeelGood sweater from LandsEnd by attending a cocktail party while at BlogHer. 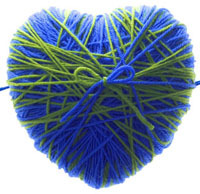 Yarn heart image is part of Lands’ End FeelGood campaign.